In 1964 the Row River experienced a 100 year flood. 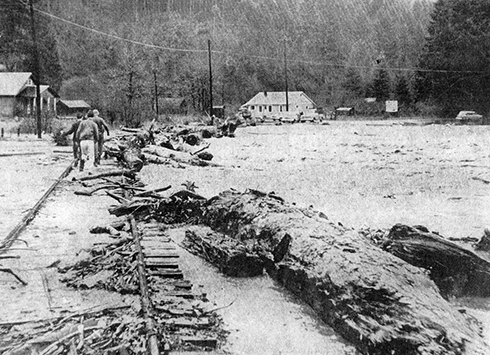 The above photo shows Rocky Point (about 1 mile up river from present day Dorena School) during the flood. Ruth Stewart, Postmistress at the time, reported that her husband put on waders and hiked down the railroad track to Rocky Point with sacks of outgoing mail. He then exchanged them for sacks of incoming mail with the mail carrier who met him there. There were reports that some of the cabins along the river were saved from being washed downstream by chaining them to trees with logging cables. Another rumor suggests that someone obtained a home by snagging it with cable as it floated by.